Woohoo! Baseball season is finally here! We have tickets for nine games so far. We bought a Pujols 5 pack plus tickets to 4 other games. Our first game is on Saturday, April 5, against the Nationals. The tickets are in the Redbird Room. Our second game is Sunday, April 6 and our tickets are in the Bank of America Club. How cool is that? The normal price for these tickets are $95 a piece but we received an e-mail from the Cardinals last week offering the tickets for $65 each. According to an article in the Post Dispatch yesterday, ticket sales are down plus April games are usually harder to sell, I guess because of the weather. Anyway, we've never had tickets in the Bank of America Club before so we're looking forward to it. The price of the tickets includes buffet service, beer and soda so, when you consider the price of food and drinks, the ticket price really isn't all that bad. The game is currently in a rain delay. The score is 5 to 1 Cards in the bottom of the third. We're supposed to have heavy rain tonight so I'm not sure if they'll be able to get the game in or not. Here's hoping for a great Cardinal season! This color combination makes me happy; Not Quite Navy, Sage Shadow and Chocolate Chip. 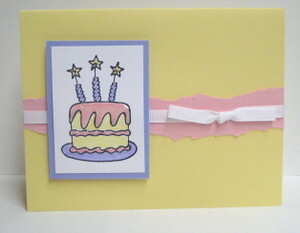 When I began designing this card, I wanted to use my new Chocolate Chip grosgrain ribbon. As you can see, there is no ribbon on this card. I tried to incorporate the ribbon into the final design, but it just didn't fit. That being said, I'm still pleased with the final result. Woohoo, baseball season starts tomorrow! Go Cards! hee hee hee...We ate at Buffalo Brewing tonight and I wanted to try the Buffalo Drool but they were out! Oh no. That's OK because I wanted to try their red ale too. It was great as was the Rye IPA. In fact, we brought home a growler of the IPA. As for the food, they have a nice selection of burgers (both beef and buffalo), wraps, and entrees. I had the blue cheese and bacon Angus BEEF burger. I don't do buffalo unless it's a brew. Look what I found...a blog devoted to beer in St. louis. It's called STL Hops - A St. Louis Beer Blog. You can check it out by clicking here. I found this blog when I was looking for information on a new microbrewery that opened recently called Buffalo Brewing. We're planning to eat dinner there tomorrow night and I'll definitely let you know how it is. I'm really interested in trying the Buffalo Drool and the Rey IPA. Oh yeah, and I'll probably try some of their food too...hee hee hee. It's my brother-in-law's birthday today. As I've said before, it's always more difficult to make a "manly" card because I can't use flowers and girly bling...hee hee hee. I used the color combo of Always Artichoke, Not Quite Navy and Chocolate chip, a fairly manly combo in my opinion. I'm going to spend some time in my "stamping studio" tonight. I'll have a few more ATC's to share with you soon. The Producers - We saw this at The Fox several years ago and loved it. We've also seen the movie several times. The song "Springtime for Hitler" cracks me up. We're really looking forward to this one. My Fair Lady - This is definitely Bill's least favorite show of all time, ever since we saw it at the Muny in 1996 starring Howard Keel. I had seen Howard Keel and Jane Powell in South Pacific way back in the 70's and he was a wonderful actor/singer. During My Fair Lady, however, he kept flubbing his lines and it was a little distracting. My Fair Lady was performed at the Muny again in 2001. That year, I saw it with my sister since Bill still had memories of the less than stellar performance in 1996. Anyway, my friend, Jenny, and I will be seeing My Fair Lady this season as Bill has graciously agreed to pass on this show once again. 90 years of Muny Magic - The description states that this is a musical journey showcasing the past 90 seasons of the Muny's "best of the best" songs from various shows. This should be great. I love "highlight" show. Miss Saigon - We saw this at the Muny in 2001 and we both enjoyed it. They even had a real helicopter fly in and hover over the stage. I wonder what the insurance premiums were for that! My One and Only - A Gershwin musical. We've never seen this but I love Gershwin tunes so I'm looking forward to this production. Fiddler on the Roof - We've seen Fiddler twice before at The Muny; in 1998 and 2003. I love this show...If I were a rich man ,ya ha deedle deedle, bubba bubba deedle deedle dum, all day long I'd biddy biddy bum, if I were a wealthy man. We requested a seat change this year, closer to the stage but in the same section. The problem is, it's not always possible to get closer seats because once people find seats they like, they tend to hang on to them and will them to their children...hee hee hee. If we don't get the requested seats, our current seats are fine. It's just that there is this really tall guy (we call him Wilbur) who sometimes sits in front of us and it is a little difficult to see through his head. The seats he has are company seats from what we can gather from conversations he has had with people around him, so he's not always there. We did get lucky once or twice last season and there was a shorter person sitting in his seat. All in all, I'd say that it looks like it will be a great 90th season at The Muny. 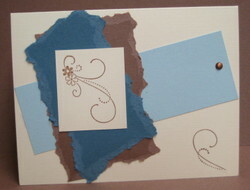 This is one of my new favorite color combos...Soft Sky, Blue Bayou, Close to Cocoa and Sage Shadow. I originally thought that Sage Shadow was ugly ugly ugly, but, paired with the right colors, it's actually very pretty. I sponged Close to Cocoa around the edges of the focal image. The Sage Shadow card stock was pierced around the edges and then the entire image was attached to the card base using dimensionals. A piece of Hodgepodge Hardware and two brads complete the design. Be sure to click on the photo for a more detailed view. Believe it or not, it's snowing! It isn't sticking on the street but there is a dusting of snow on the ground. It is spring, right? My youngest niece, Sarah, turned 10 last Sunday. Lisa, Randy and the kids were in Chicago on a long weekend vacation Sunday so her birthday party was tonight. I can't believe she's 10. 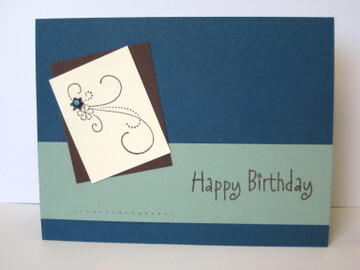 Here is the card I created for her. She likes yellow so I decided to use Barely Banana for the card base. The image was stamped in black and then colored with my @Stampin' Up markers. I added Crystal Effects to the icing to give it a little extra shine and small Amuse twinkle stickers to the "flames" for a little extra bling. Here is the card I promised in my last post...better late than never, right? Anyway, this time, Soft Sky is paired with Close to Cocoa, Not Quite Navy and Very Vanilla. I'm definitely going to have to stock up on Soft Sky before it retires in July. It's quickly becoming one of my favorites. As for the focal image, I love the new Friendship Blooms set. I especially love the swirl image from this set. I decided to ink just part of the image and then stamp in on the lower right side of the card. 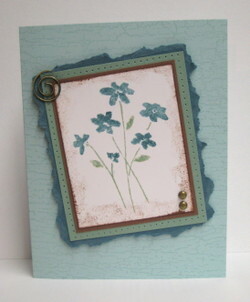 I'm working on another ATC for a swap I joined. I've made one but I'm not completely happy with it so I'll have to work on it a little more to see if I can come up with something different. Once I decide on a final design, I'll be sure to post a picture. Bill asked me to make a get well card for one of his employees. This is a very simple layout but it's one that works with so many images and I seem to use again and again. I love Soft Sky paired with Certainly Celery. Throw Chocolate Chip in the mix and it makes it even better. 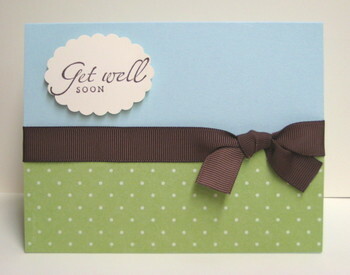 I really love the @Stampin' Up wide grosgrain ribbon. In addition to the Chocolate Chip, I have the wide grosgrain in Certainly Celery and Very Vanilla. I think I need to add Old Olive and Brocade Blue to my collection too! 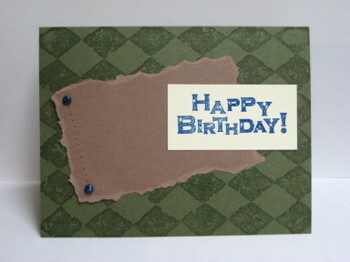 I was nominated for "Happy Mail" on Splitcoast Stampers! You can read all about it by clicking here. I have no idea who nominated me. If my secret friend is reading this, thank you for the nomination! Did you notice my new signature? I created it a few days ago. It's from a website called My Live Signature. They have many fonts and colors to choose from and naturally I had to chose the one that had hearts!